The town of Slough, the name of which actually translates to ‘Soil’, is somewhat maligned in popular culture, largely due to it being the setting of David Brent’s ‘The Office’, but with a growing population of over 160,000, it perhaps needs a more balanced view taking on it. Situated right on the M4 and also close to the edges of the M25, it services Greater London, and not only that, it’s an attractive location for business and commerce, with some large multinationals liking among other things the excellent transport links and also the proximity of Heathrow Airport. The famous Trading Estate, fictional home of Brent’s Wernham Hogg, is the largest privately owned of its kind in Europe. Slough is also recognised as the most ethnically diverse and multicultural town in the Country, with large Indian and Pakistani communities notable in size. Immigration it appears, started in the 1930’s with an influx of the unemployed Welsh! From a football perspective though, considering the size of the population and the economic advantages the business sector provides, life has not been at all easy for Slough Town. 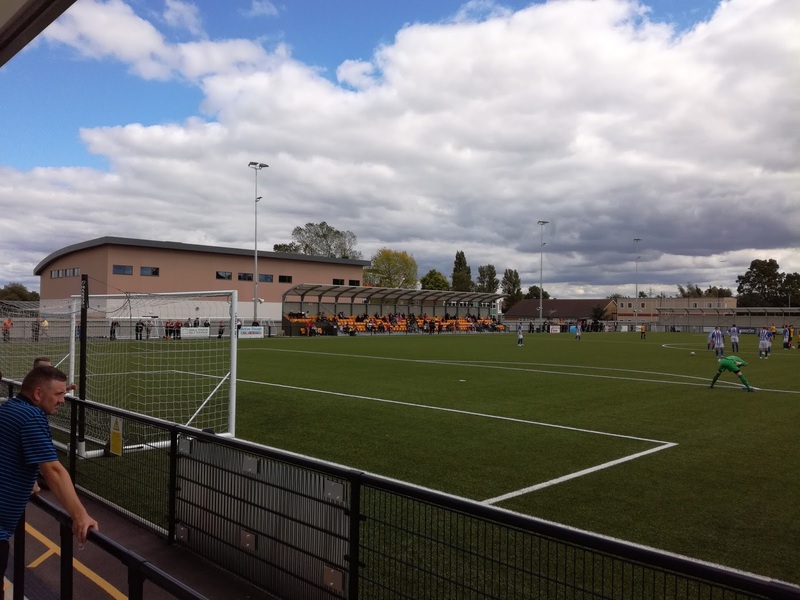 Originally playing at the Dolphin Stadium in the town, the club moved to Wexham Park in 1973, where they remained until 2003 when the landlords evicted them. It was during the nineties that the club was at its most successful, spending a number of years in the Conference National League. 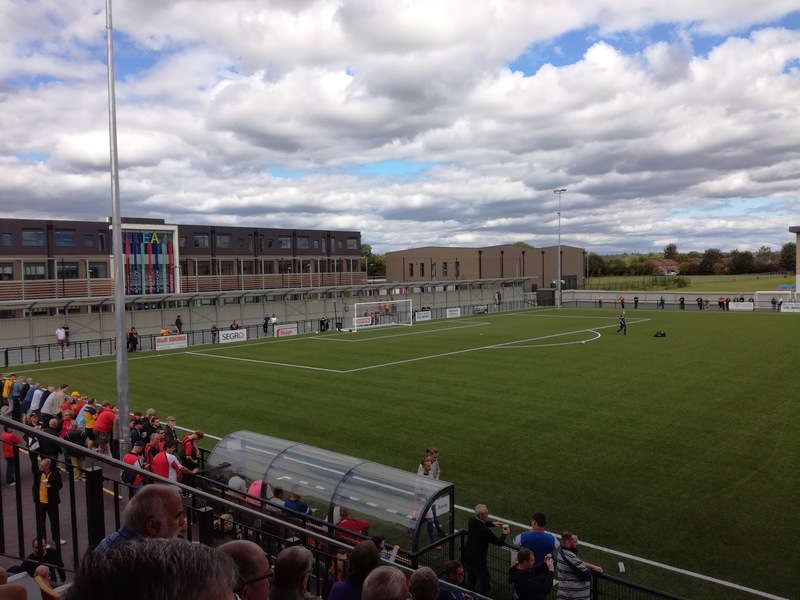 Groundsharing took place at both Windsor & Eton and Beaconsfield SYCOB while the club battled to secure a move back to the town. Consequently, a drop through the leagues took place. 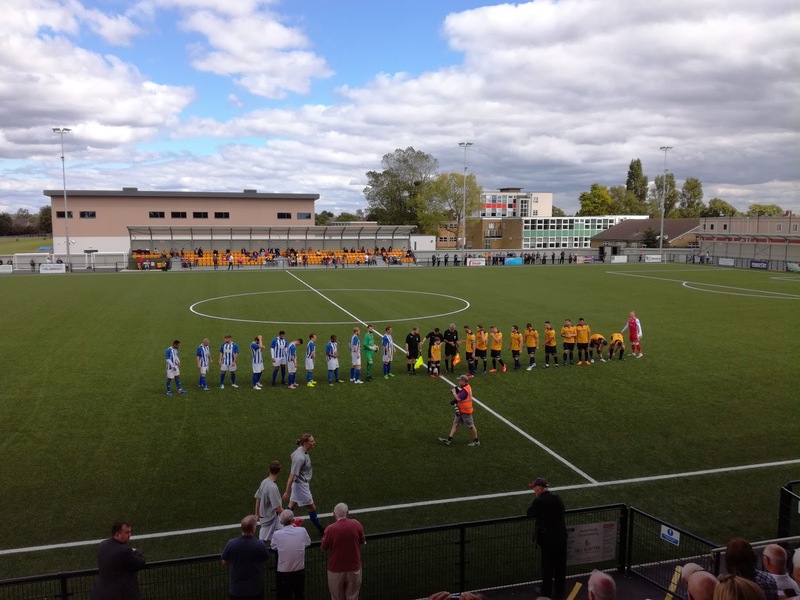 After much wrangling and heartache, the club finally moved into the impressive Arbour Park at the start of last season, they are eventually back in town, and it seems the public of Slough are backing them, with large crowds tipping up for games. 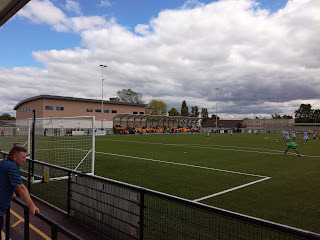 I walked from Slough Station along Stoke Road, it took around ten minutes to get to the ground, and once inside I have to say I was hugely impressed. 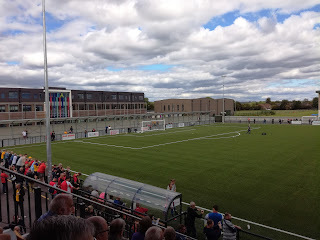 The large main stand contains a clubhouse at the top with a glass viewing gallery, this also opens out to the sides where the game can be watched al fresco. The stand itself is quite steep and offers excellent views, it really is top drawer in my opinion. 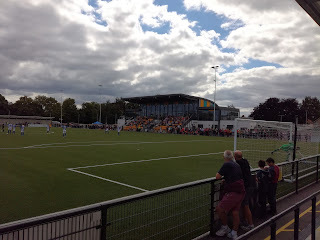 Opposite is a smaller seated stand, while behind both goals are covered terraces offering an elevated view of proceedings. The pitch is artificial, which from an economic point of view is a real win for the club. 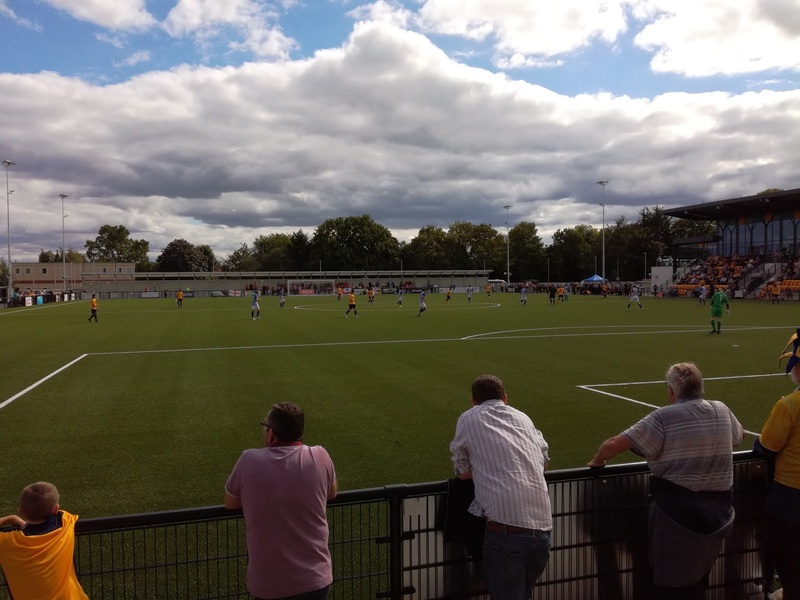 What Slough have had to wait for is fantastic, I can only see them going from strength to strength, and after missing out on promotion last season, I expect they will be in the mix this time around. An impressive crowd of 760 turned up to see another of the favourites in the shape of Kettering Town, who themselves brought a large travelling support. With the sun now beating down, I chose to spend the first half behind the goal Slough were attacking, but it was the visitors who had the lead at half time thanks to a flicked header from the experienced Brett Solkhon. Slough upped the ante at the start of the second period, and I’d now taken up a position in the smaller stand, right in front of the two chaps who were doing the commentary for Poppies Radio, and it was just as I left them to walk round to the exit that Ben Milnes scored a second for the visitors following a quick breakaway. Almost from the re-start, James Dobson scored the best goal of the game from 25 yards but it was merely a consolation for the disappointed hosts. A quick getaway at the end meant I could get across to Reading in time for the train that would ultimately mean I could change in Chesterfield and get to meet Mark in Alfreton around 9.30 for the golden ticket handover. I walked into the Victoria where Mark was lamenting Alfreton Town’s heavy defeat at Darlington, we chewed the fat and had a pint as football fans do before I made the two bus journey back to Belper. 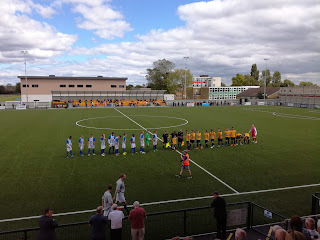 What a superb day, all went like clockwork, two great hosts clubs, smashing grounds in very different ways (the oldest and also one of the newest around), while the football itself certainly kept those watching entertained. I’ll await Mark’s next phone call eagerly, he reckons this ticket may not be the last………..